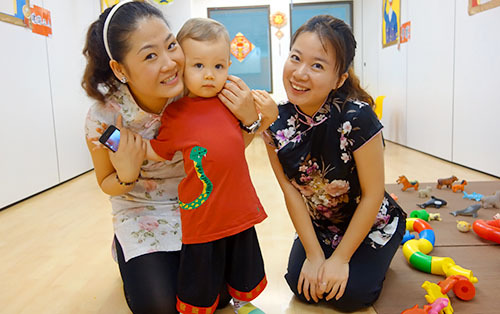 CHENGZHU MANDARIN SCHOOL | Beverly's Net: family. food. fashion. 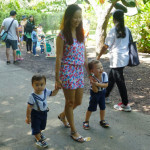 CHENGZHU MANDARIN SCHOOL – Beverly's Net: family. food. fashion. 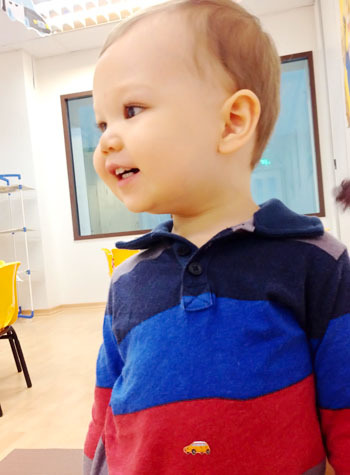 Every kid I know in Singapore that’s Hunter’s age (2 yrs old) is either in full-time school, or in some form of schooling. Here, everyone starts super early because either both parents are at work, or they want their kid to have a head start in education (though, if everyone is doing it, it’s not really a head start any more, but rather to prevent your child from being left behind!). 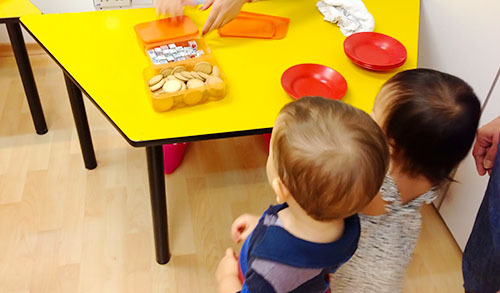 Hunter, however, had not been enrolled in any form of playschool because I felt that as a SAHM, it would be better for him to have interaction with me rather than be alone in school. After all, there’s looaaads of time for that once he’s older and starts proper school! Still, I feel really nervous and.. well, left behind, when I hear about all the kids his age being pumped with information day-in day-out. And it shows. When I see kids his age and compare to him, I do think they are ahead in terms of academics. And our kids are only 2 years old!!!! I DON’T want him in full-time playschool though. Not yet. And so I’ve decided on a program that’s 2-hours long, twice a week. It’s more of play time for him, and my main goal is for him to learn social interaction and positive social behaviour… not for him to be pumped with his ABCs and vocab etc etc. So Hunter’s recently started at Chengzhu Mandarin Centre. And you know what? My girl friends think I’m a bit mad to do this, but I maintain it is a good decision. First and foremost, Chris and I can’t speak/read/write Mandarin. Yes we got by in Shanghai, but on bare minimum.. nowhere near half-fluent. Because of this, guaranteed our kids won’t feel familiar or comfortable with Mandarin. Secondly, China is a giant that is going to take over the economic world. It will be beneficial for our children to be fluent. Thirdly, the Mandarin that the average Singaporean speak is pretty poor. Wrong accent, badly butchered, and lots of random non-Mandarin words thrown in. I can actually understand (some) Mandarin when spoken in China, but can’t quite understand when spoken in Singapore. I want our kids to learn and speak it properly. The teachers at Chengzhu are from China. Chengzhu is owned by Julia Gabriel, a renowned school in Singapore. 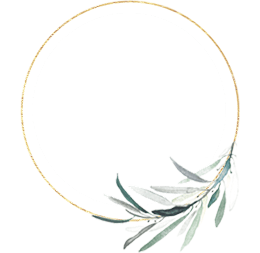 They are really well run, and the programs are excellent. I was so impressed when we went for a trial class. Their teachers are from China and soooooooooooo wonderful. Hunter is not a kid that takes to people easily, but he loves them… dishing out big hugs and kisses – very rare by Hunter’s standards!! The teachers are captivating, engaging, and super good with children. 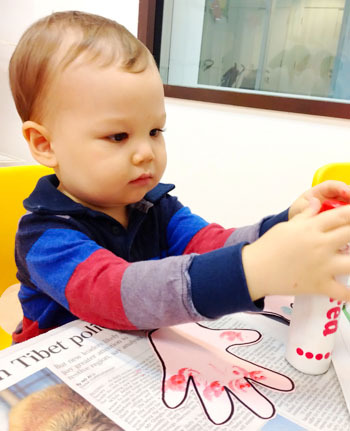 He doesn’t learn his alphabets or spelling or numbers or anything like that… but what he gains instead is social skills, a love for learning language, and a chance to be in a 100% mandarin-speaking environment. And that, to me, is excellent for him. 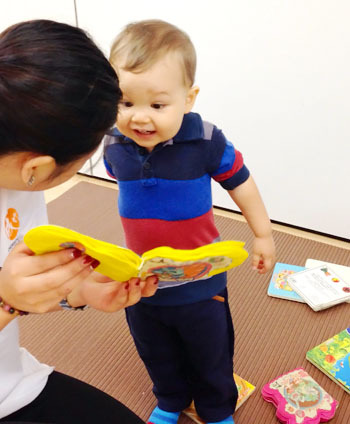 Will he attend proper full-time English school? For sure. But not yet. Looking like he completely understands the Mandarin books, haha! Snack time! Bizarrely, he’s not v into this. More often than not he’ll just sit there and watch the other kids eat. Cannot understand this. Since it’s Chinese New Year this week, the kids and parents were asked to dress up. 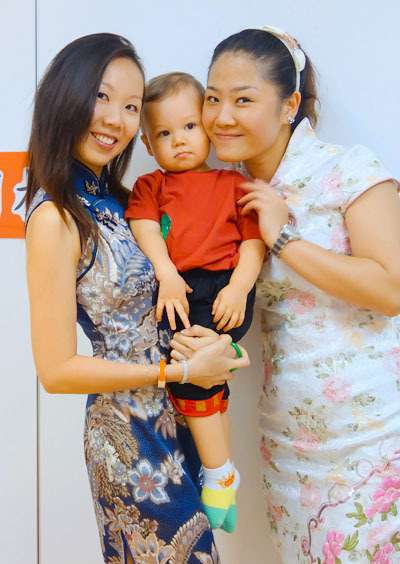 I wore my wedding cheongsam, and Hunter a Joules super soft tee with a snake on it (Year of the Snake, geddit?) plus a pair of Emperor-looking pants. I rather liked his outfit as it was CNY-ish, yet not a traditional one. I love his tee in this pic! Plus being at home for 4 years, Siena learned and developed fine. We never had any worries she would fall behind by staying at home. I like that. I do think that kids don’t need to start school so early. Problem is, because it’s the norm in SG to enter school at a ridiculously early age… if you don’t do the same, your child does appear to be ‘behind’. Argh!!! I say let kids be kids… lots of time to study later. I didn’t start school until I was 5 years old, and I think I turned out okay? I think so too, hehe! And, ideally, I’d like them to be fluent in French too.. Awesome idea..and you know..he’s got loads of time to catch up…though I’m sure there won’t be much that he would need to catch up on…if you really think about it! He needs to practice his Mandarin though!! or else it’ll be such a waste! 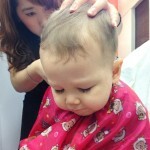 I hope that, when he does start proper school, he won’t lag too far behind and picks it up quickly. I guess we will see! Sigh. I feel the stress too honestly, altho my preference is to have the kids interact with me and being taught by me as much as I can. If not for the fact that I have to work, I wouldn’t send the kids to any formal classes till they are 3 at least. That aside we also can’t afford anything more than the childcare service the kids attend at this juncture. So I’ve decided to be a bit more disciplined and speak to them in mandarin, read to them in both english and mandarin and teach tabby to read myself. And yes.. I do feel its no longer a head start anymore, but if you don’t, it’s like you’ll be left behind. Sad. I do like the 3 yrs old mark too.. I just feel that kids ‘lose’ a lot of their childhood once they get sucked into the education system of STUDYSTUDYSTUDY, so I want mine to enjoy themselves whilst they can. You’re lucky that Tabby is really bright, even my parents have noticed it! Agree that they wld lose so much childhood once they start! I feel like such a wet blanket when I try to teach Tabby to read.. Like I am so kiasu! -_- but it’s really hard in Singapore. Sometimes I wish we have the option to raise them somewhere else. ahh, that would be so nice if they’re fluent in french too! actually i would love that for my children (future children) too. I think he wouldn’t be too fazed! He can differentiate between the languages. But all you’ll get from him is lots of “ni hao” and “gong xi fa cai”, spoken repeatedly, lol!! haha! well, very apt for the CNY period. would be pretty cool to hear him say “gong xi fa cai” albeit repeatedly 😀 and! actually i would be taking up your suggestion about thursday for next week! will twitter message you again, just a heads up first. i’m far from being fluent in french man! but definitely working towards it now. Next week thu? It’s a date! I hope he loves to learn the language and speaks it well! Its a nice place and program. I did playnest and playclub with my older girl when i was a sahm (at jg evans) Now she’s at cz taking the chinese class once a week, same for meimei. I’m not big on enrichment classes but sad to say my girls’ chinese are not great so this is the only class they do. I sent #1 to GUG and they had 15 mins of Mandarin per class and I was totally loss ahahaha and I took Mandarin in school! Now #1 is in Nursery and I also send her to Berries and she’s loves chinese nursery rhymes. #2 (Hunter’s age) watches it with her but doesn’t seem very interested, sigh. She’ll start Berries next year at 3 as well. Ooo may I ask how she finds Berries? I am thinking of putting Hunter in that later (after he starts proper english school). Would you recommend it and you reckon it’s helpful? She liked it the first year (playgroup, the year they turn 3) and then this year (the year they turn 4) … not so much. We have to teach her every weekend so that she doesn’t go to her Berries class clueless and the additional DVDs we buy helped to. I just took my girl out of Cheng zhu this year. She’s slightly younger than Hunter and was in Cheng zhu the whole of last year. In fact she was in Li Na (teacher) class as well. What a coincidence! She is very good. Oh wow what a coincidence! Did you like Cheng zhu? May I ask why you took her out of it? 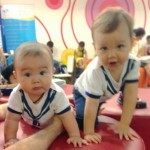 Hunter ADORES Li Na laoshi. She is soooo good with him and kids in general! I took her out as I gave birth in January and wouldn’t be able to attend classes with her. So she’s now at a drop off programme at a Montessori school.